Fire protection projects, cable surveys and other activities from July to September 2018. In this quarter we present a selection of cable fire protection projects, cable surveys and business activities in many countries. For updated information and news, please visit our Facebook page that reached 8000 followers in September. Cables Are Everywhere – and So Are We – In All Industries! Electrical cables are the nerve system of your business, whether you run a melting plant, power plant, refinery, oil-rig, hotel, hospital, a cruise ship or a tanker. We repair damaged cables to keep the operation running and protect cables from environmental damage and fire to save assets, protect your business and save lives. Cable survey at Pulp and Paper plant in Indonesia. 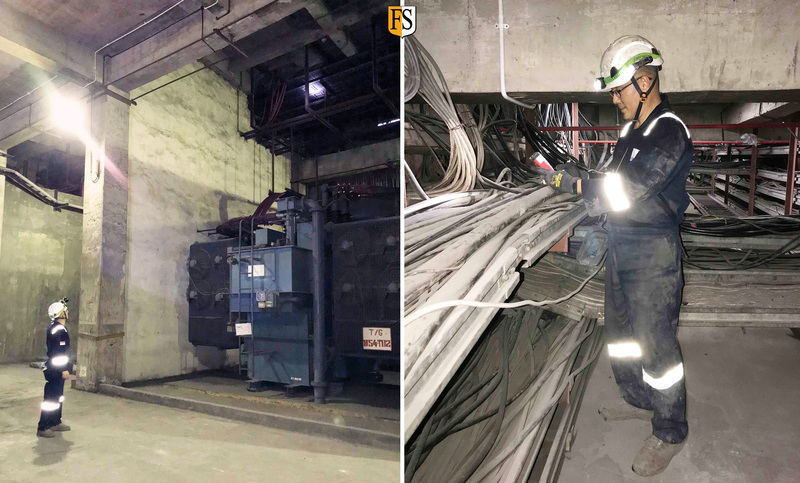 July 3 – Steven Chong, Project Supervisor at Fire Security Asia-Pacific surveying various area in the plant to offer a solution to fire protection of electric cables. When cable trays are overfilled, excessive heat build-up in and around live conductors. This can cause the insulation to break down, leading to potential shock hazards of fires. Fire protection in underground cable tunnels. July 13 – Cleaning the cables is essential before we do the fire protection coating. This is our second project in a year for a major Cement company in Indonesia. 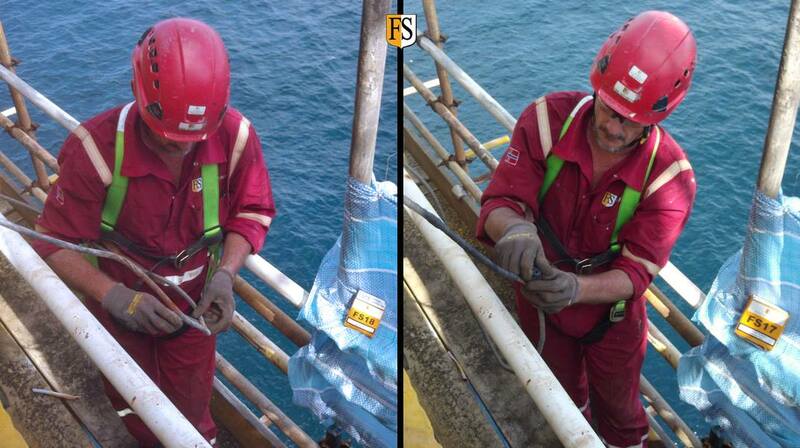 Cable repair life extension on offshore platform. August 2 – Paul Filby carrying out cable repair using copper mesh and splicing tape. FS18 (left) is an Electrical Shielding Tape and FS17 is a Linerless Rubber Splicing Tape. Industrial cable fire protection in South Korea. August 30 – Another successful Fire Protection of electrical cables project completed. Photo from left: Our client represented by Mr. Park, Electrical Engineer, our Local agent, Mrs. Park, Kangnam Drive. 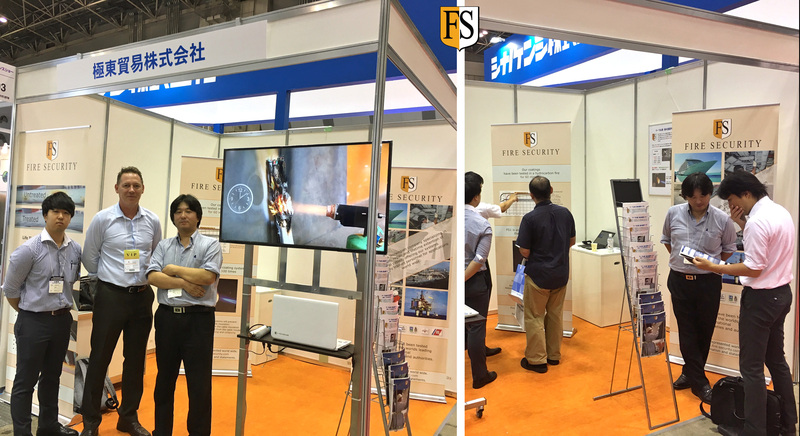 Co., Ltd, and Steven Chong, Fire Security Asia-Pacific. Fire protection on Equinor’s new offshore platform. 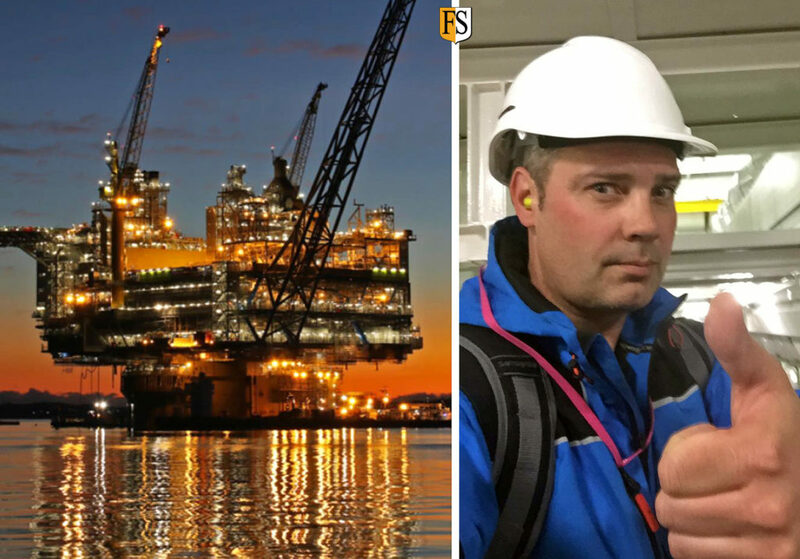 September 4 – John Ryen has been on board Aasta Hansteen platform this week completing a project for FS. 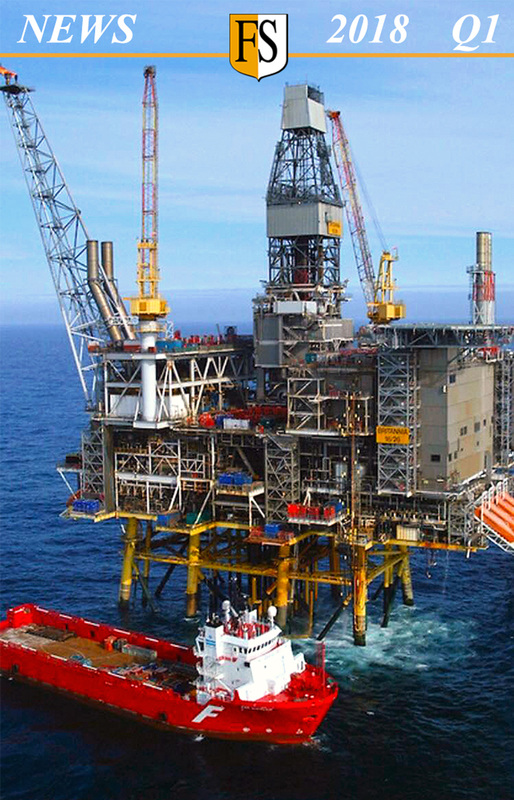 The platform is to start production within the month of September and we wish the owners Equinor earlier named Statoil good luck with the startup activities. Recertification on board Carnival Fascination. September 12 – CABLE FIRE PROTECTION. Completed 10 year recertification of Carnival Fascination in San Juan, Puerto Rico. Piotr Bober with Staff Chief Engineer Luca Azzarelli. 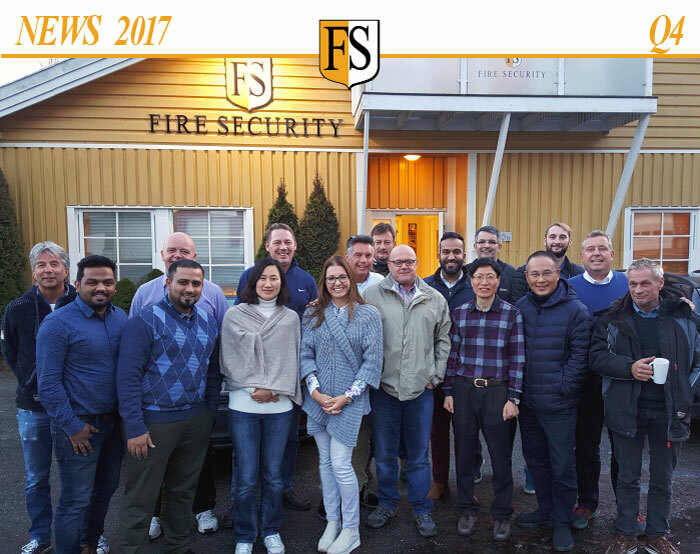 Fire Security Middle East and Managing Partner Jesper Rexen celebrate 15 years in business. 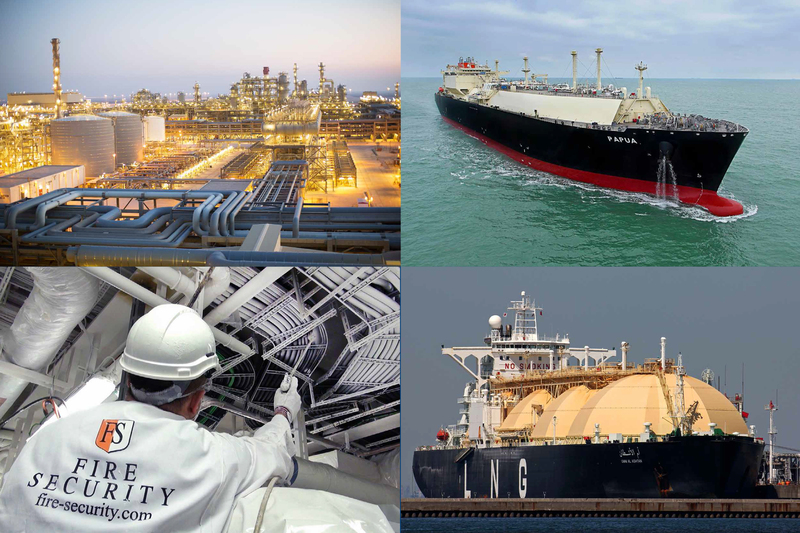 September 27 – More than twenty LNG carriers have been fire protected since 2015 and we also do cable fire protection and cable jacket repairs at LNG refineries and other industrial plants. See blog post. 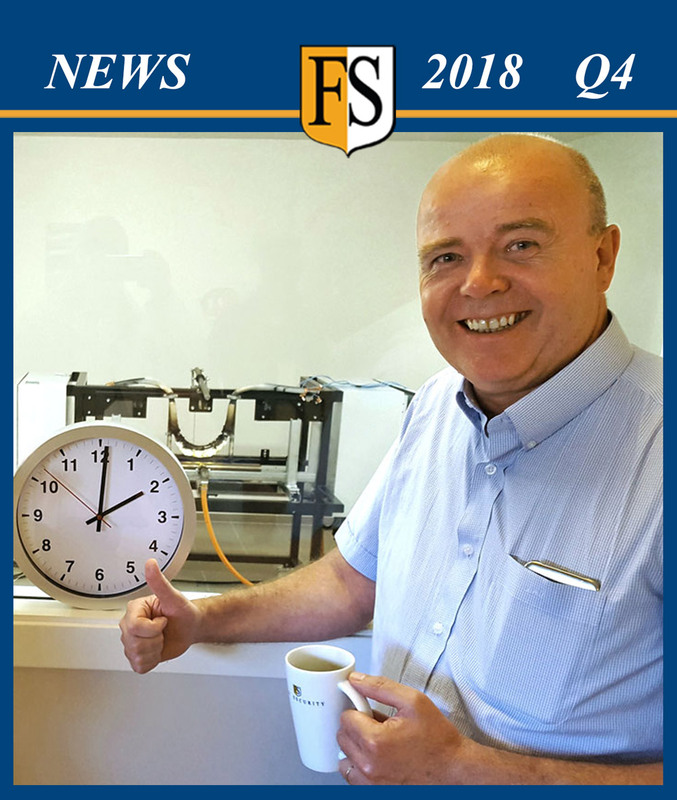 See Q2 Newsletter or follow us on Linkedin or Facebook for more news. DNV-GL approved cable repair in Singapore. July 5 – Paul Filby, Project Manager of Fire Security supervising the process of cable repairs. 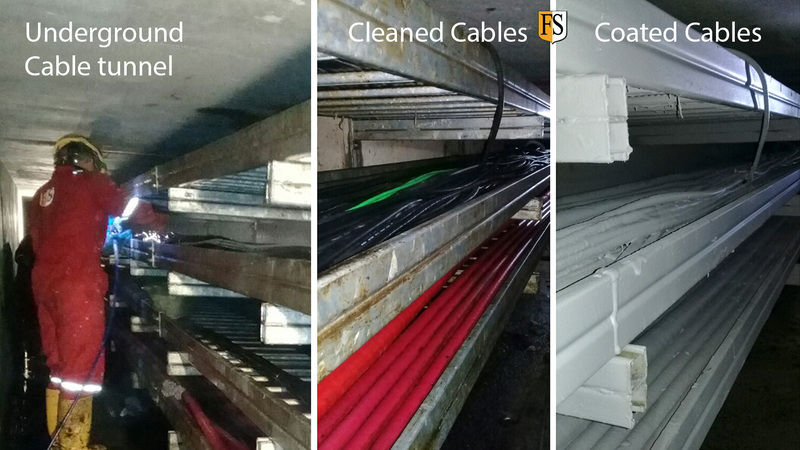 Cable repairs were carried out in accordance with our DNV approved repair method. Where cables outer sheath were found cracked open, these were removed from the tray, repaired with our FS 17 splice tape and made fire resistant with the use of our FS 5 Cable coating. Photo from left: Arianto, Paul Filby, Steven Chong, Supriyono. 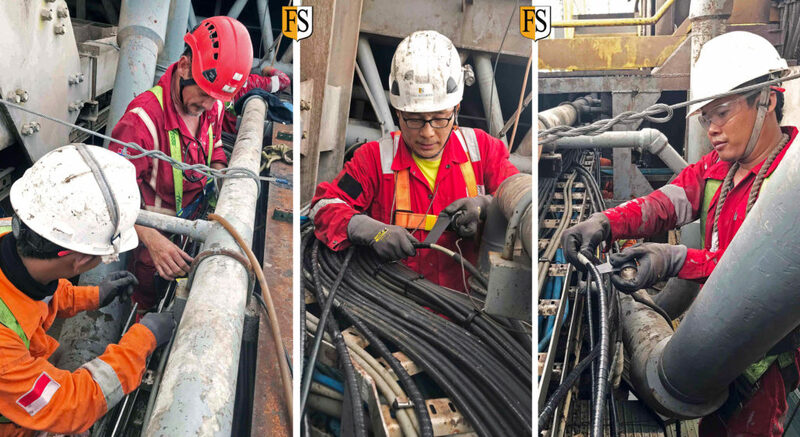 Cable life extension for Brunei Shell Petroleum. 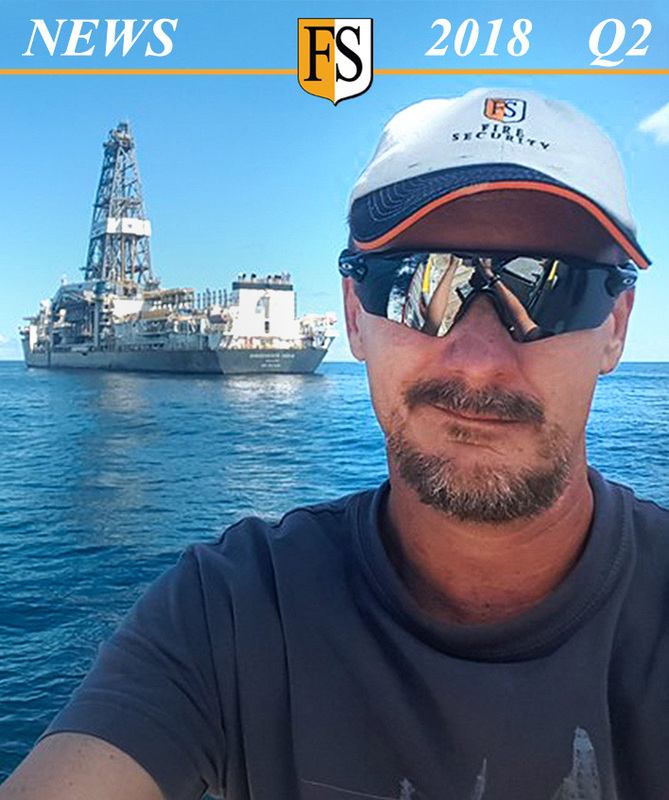 July 9 – Paul Filby is “on fire” offshore for Brunei Shell Petroleum where we are working on cable life extension on their big Champion-7 platform complex. Participating at Maintenance Exhibition in Tokyo. 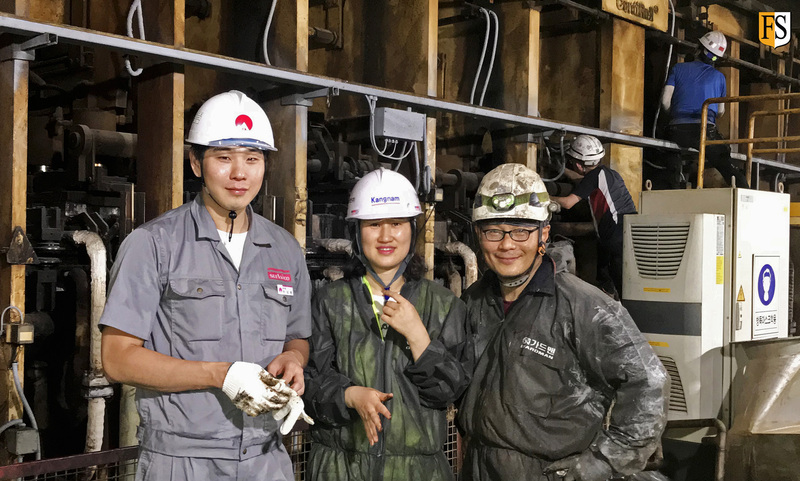 July 24 – We have been in Tokyo this week participating in a big maintenance exhibition together with our local agent, Kyokuto Boeki Kaisha Ltd. For inquiries in Japan, please contact Onozaki-san at www.kbk.co.jp From left: Kohei-san, Paal Mathisen, Onozaki-san. Repair and life extension of HV cables in Indonesia. 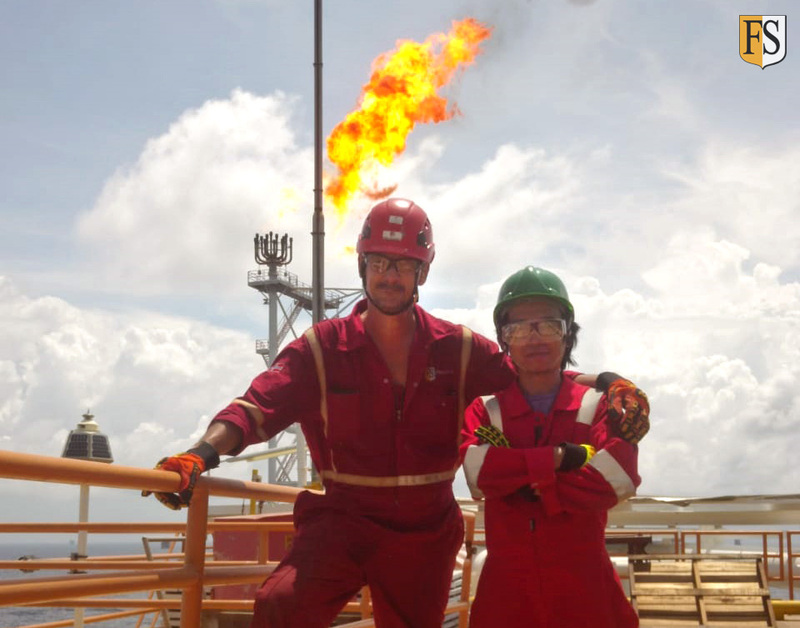 August 27 – In Indonesia we are working with Pertamina both offshore and onshore. Here from todays pre-tender discussion for repair and life extension of HV cables. August 31 – Completed project for Holland America Line. 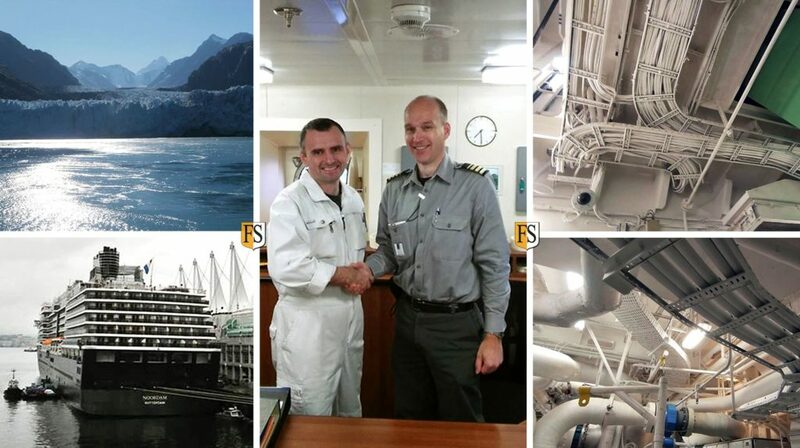 Staff Chief Engineer Mr. Alex Hekker (left) congratulates Marek Bober and his application team with the completion of a 10 year recertification on board Zuiderdam. All the cables that were originally protected by Fire Security more than 10 years ago have now been upgraded to the highest fire protection standards in the world. Visiting oil & gas operators in Australia. 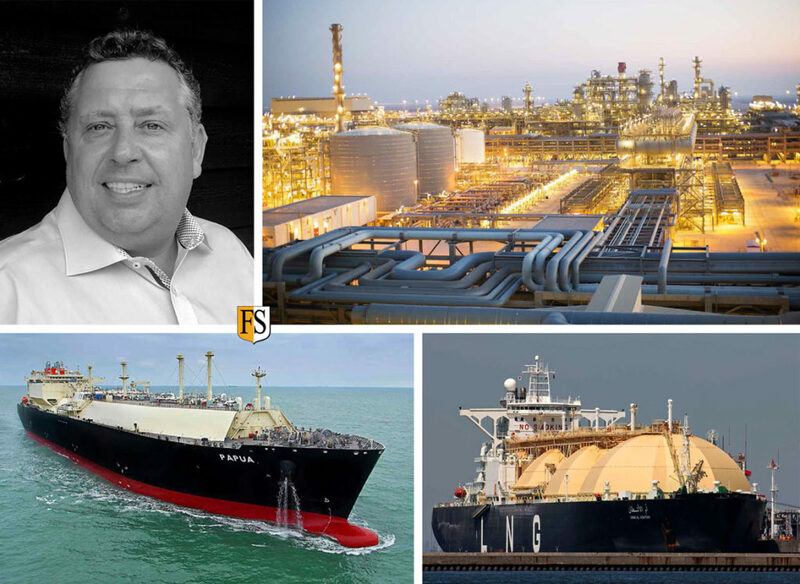 September 11 – Visiting our agent for Australia, International Corrosion Services and Mark Hanna for meetings with the oil & gas operators in Western Australia and Northern Territory. Meeting with Petronas oil & gas in Malaysia. 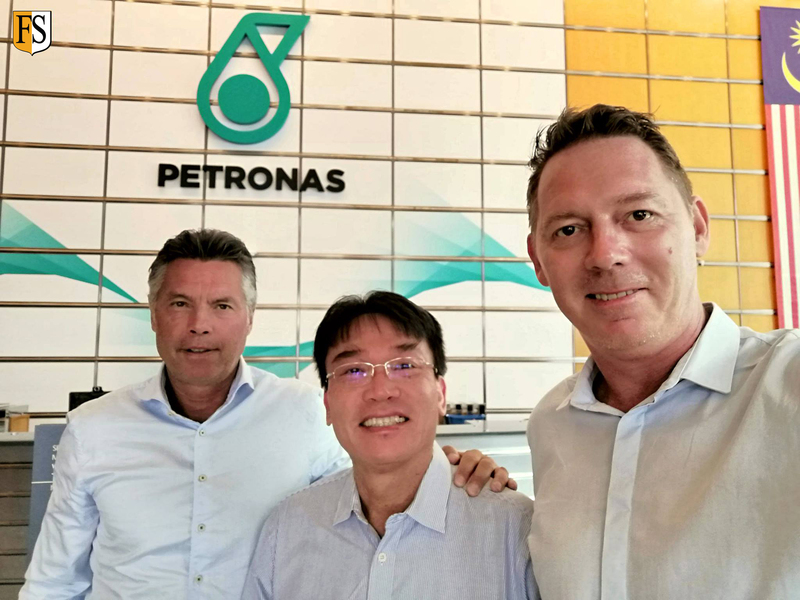 September 13 – Todays meeting with Petronas in Kuala Lumpur together with Jhonson Gana from our local agent, Nargis Petroleum. Agenda: life extension of cables on offshore and onshore assets. 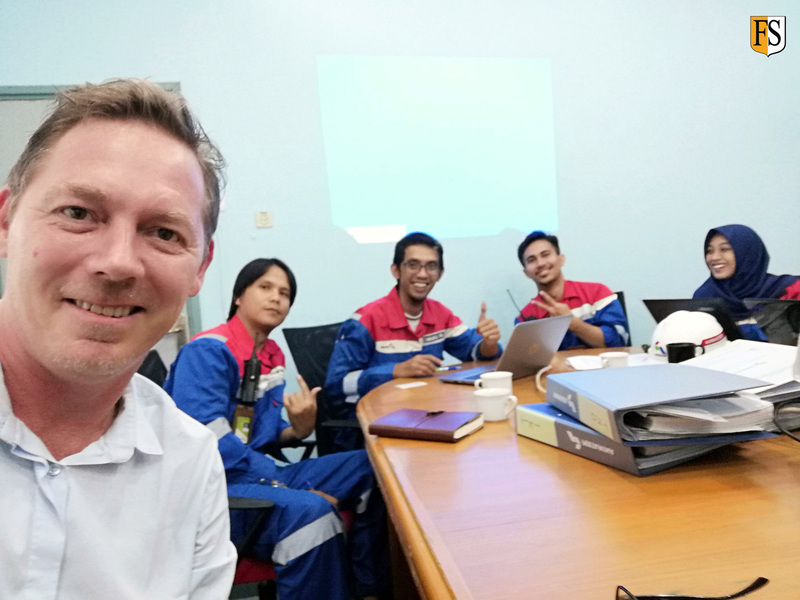 — with Ole Tom Eidjord (left) and Paal Mathisen (right) in Kuala Lumpur, Malaysia. Fireproofing in Alaska for Holland America Line. 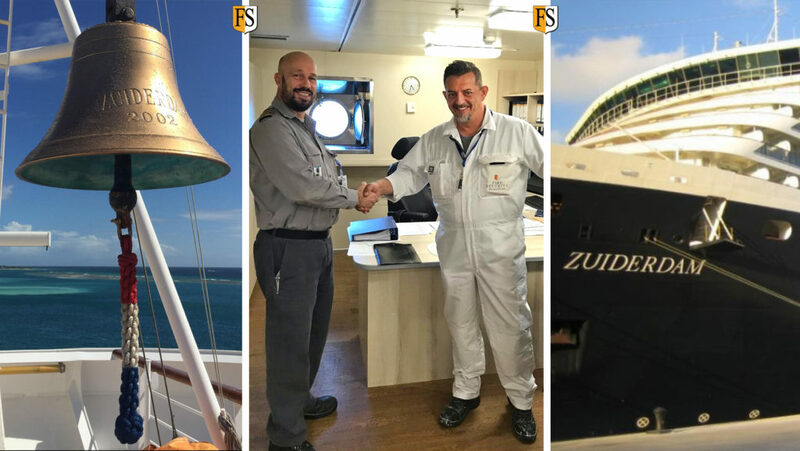 September 30 – During an 8 days cruise Piotr Bober and his coating team completed recertification of the Holland America Line vessel Noordam. Handshake with Staff Chief Engineer Erwin van Elzelingen. Fire Security providing better Safety at Sea. 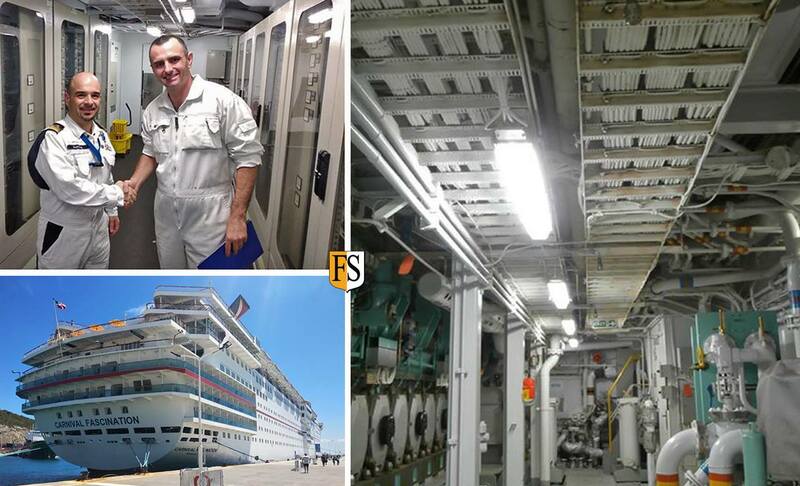 September 23 – John Ryen completed a cable protection project on Le Ponant in Italy. This ship became internationally known on the 4th. of April 2008, when she was hijacked and captured by Somalian pirates on her voyage through the Suez Canal. 11th. of April the ship was returned. Cables are Everywhere – and So are We – Offshore-Onshore. We use our FS1 intumescent coating for interior use and FS5 ablative coating for both exterior and interior use. Our cable coating systems will guarantee that your cables will function properly under a fire and be reusable afterwards. By protecting cables and cable trays we also contribute to reducing the risk of structural damage and loss of lives.